This title is a bit harsh, Last-Minute Holiday Decorating Ideas For the Truly Lazy | Apartment Therapy, because if you are like me and you still needing to decorate, it’s likely you aren’t so much lazy as you are too busy. Either way, lazy or busy, read that article and you’ll have lots of ideas to get your place looking more festive right away. As for me, I find grabbing 3 or 4 small poinsettia plants and filling up a few cheap glass vases with Christmas tree ornaments gets the place looking quickly more seasonal. What all the images have in common is the use of natural decoration, from boughs to wood to wreaths to baskets to lanterns. It’s seasonal, but timeless. If you find it too austere, mix in some holly or some ribbon. Enjoy the season, and the beauty of this time. Posted in advice, decor, new! 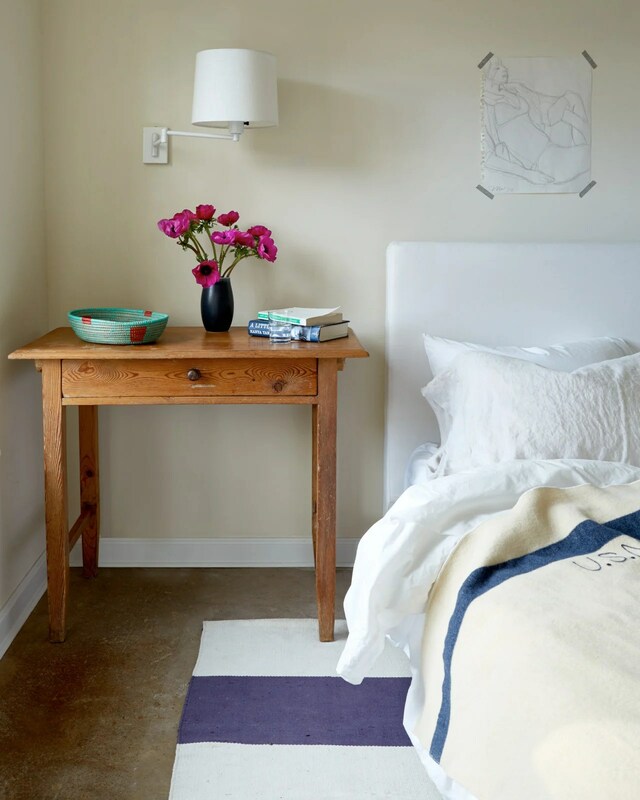 Some of you might hate them, but there is something cozy and restful to me in these type of bedrooms: (Really) Small Bedroom Inspiration | Apartment Therapy. They make me think of sleeping on a train. Good night! Before & After: Budget Bathroom Upgrade | Apartment Therapy – it doesn’t take much to upgrade your bathroom, and if you want a manageable space to redo, this may inspire you to get going on this. Furniture Finds: 10 bold and brilliant removable wallpapers – perfect for people who want the boldness of wallpaper, but also the ability to change your mind. The Best Plug-in Sconces (No Electrician Needed!) | Apartment Therapy – like the wallpaper, this is another good idea for people who don’t want to commit. 31 insanely clever cleaning hacks for your messy home – before you decorate, you need to clean. Use this to get your going. Affordable Vintage Rugs – Best of Etsy – rugs make such a difference, but they can be very expensive. Use this to help with that. 5 Ways to Update Thrift Store Art | Apartment Therapy – original art is better, in my opinion, but if you have lots of walls and/or lots of thrift art you want to use up, check this out. A Brief History of Memphis, The Design Group that Defined the Look of the 80s | Apartment Therapy – I don’t know if we will ever see a resurgence of the Memphis Design style, but in the 80s it was influential. Not everyone’s cup of tea, but interesting nonetheless. The Kitchn’s Guide to Cleaning Your Small Electric Appliances — Cleaning Guides from The Kitchn | The Kitchn – more good cleaning advice. A Bubbly Life: DIY Wooden Shoe Rack – this is a great, simple project for anyone. I am not sure how good it is to sit on, though. Be advised. A First Apartment in Boerum Hill | A Cup of Jo – a great place. Lots of ideas to take away from here. Grown-Up Versions of Your Favorite Teenage Decorating Trends (You Won’t Believe How Good They Can Look) | Apartment Therapy – ha! If you miss your old room, you can go back again…and reuse those ideas. DIY Mid Century Modern Coffee Table (Under $50!) – Wonder Forest – another good DIY project. This one is especially good if you want to design a table that fits a particular place. Other than Ikea’s Lack table, you won’t find a cheaper one anywhere, save a garage sale. 25 Clever DIYs for Small Spaces | Apartment Therapy – more good do it yourself ideas. Get the Warm Industrial Look on a Big Box Store Budget | Apartment Therapy – if you like that look, you can get it without shelling out big bucks at places like Restoration Hardware by reading this. This is What It’s Really Like to Live in One of Those Tiny Houses | Apartment Therapy – intriguing. Bright Ways to Beautify a Basic, Boring Bookcase | Apartment Therapy – more good ways to improve your house. 7 Ways to Fill a Wall that Are as Useful as They Are Beautiful | Apartment Therapy – have a big wall? Here’s some good ideas to make it look great.